The Startup America stage as part of Eureka Park at the International CES started off with a bang this morning. Startup America CEO and technical co-founder of Priceline.com, Scott Case got a chance to have a fireside chat with Tony Hsieh. 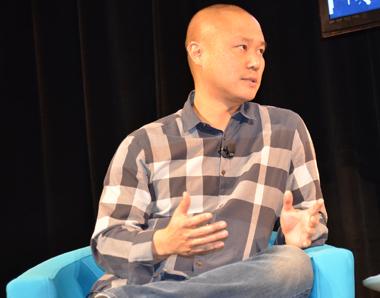 Hsieh is the CEO of Zappos, the founder of Link Exchange and the founder of the downtown project. 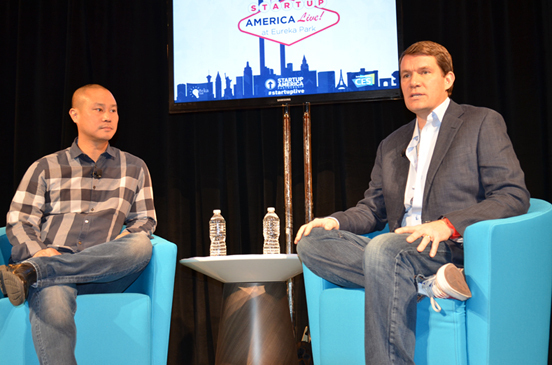 Their intimate fireside chat gave the standing room only crowd a peak into Hsieh’s mind. Hsieh founded his first company, Link Exchange, with his college roomate in 1996. They exited from Link Exchange by selling it to Microsoft just two years later. Early in the discussion Hsieh discussed the real reason that they sold Link Exchange. It wasn’t about the money, an enormous exit or even getting bored with the company. Hsieh and his partners decided to sell Link Exchange because the culture went bad. ” I was dreading waking up and going to work at my own company” Hsieh said during the fire side chat. From that point forward culture has played a crucial role in everything Hsieh does, from the companies he invests in to the employees Zappos hires. To one end culture is a condition of being around people you like “I try to be around people I like being around”, pretty simple concept, but it transcends across just your friends and personal circles. ” companies that have strong cultures out perform companies that don’t” Hsieh said about several studies that have been done on the subject. Numerous articles have been written about Zappos and the community of employees that work there. Even though the company famous for their “return it for any reason” shoe return policy, is part of Amazon.com now, Hsieh said that it was a prerequisite to selling to Jeff Bezos that Zappos still functions independently. Zappos recently moved their warehouse operations to the Amazon umbrella because warehousing is something Amazon exceeds at. Hsieh and his other Zappos executives still handle customer service, marketing and every other part of the business. Zappos is always mentioned alongside companies like Google when it comes to culture, and lifestyle within the Zappos campus, which is moving to the old Las Vegas City Hall next year. It’s the company’s culture that drives their employee base. When Zappos has a new hire they go through a traditional interview, once they pass that interview, the next interview is entirely based on how that person will fit in the company culture. Case commented that when they were growing Priceline.com that culture was important as well. Like Zappos, at one point Priceline went from a company of 10 employees to over 100. In the early stages one person accounted for 10% of the culture. “10% changes the culture if you’re not careful about it” Case warned to startup founders in the room. Culture is just as important to Hsieh in his Downtown Project/Las Vegas Tech Fund companies. He wants to know that startups and their founders will fit in the culture in Las Vegas. Hsieh committed to investing $350 million dollars in growing downtown Las Vegas (not the strip). He wants to make it the biggest and best city for coworking in the world. Startups and entrepreneurs in the downtown Las Vegas community, and Hsieh’s employees for that matter, live by the Three C’s, collisions, community and co-learning. Hsieh has $50 million dollars set aside for investing in startups and small businesses. To be the recipient of part of that money though, Hsieh looks at the possibility of ROC (return on community) verse traditional ROI (return on investment). Hsieh just invested in a building at a prominent intersection in downtown Las Vegas. They are using that building for a community speaking theater where distinguished entrepreneurial and startup speakers will speak to community members. Hsieh admits that any other real estate investor could make a lot of money with the same location for a bar, restaurant or even a McDonald’s franchise. From all the different parts of Hsieh’s business life, everyone in the room benefit from Hsieh’s discussion with Case. He even let on to a milestone Zappos recently had, their longest continuous customer service phone call. The length, 10 hours.